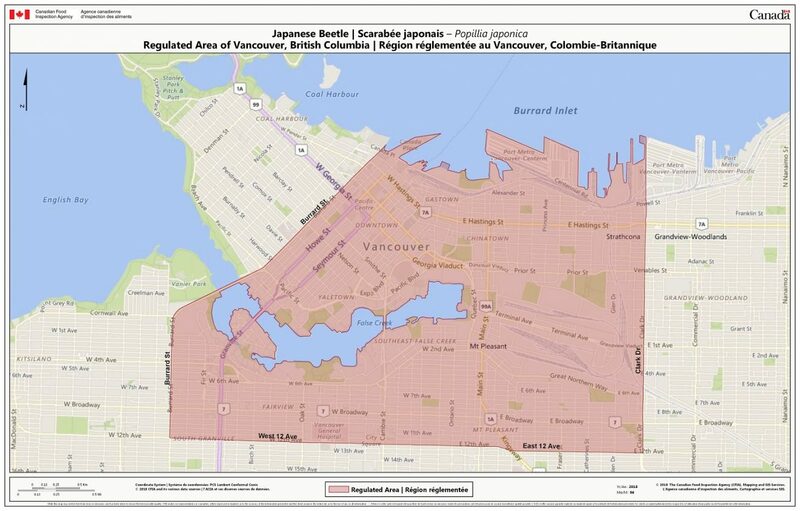 The number of Japanese beetle found in the Vancouver area continues to climb. Please use precaution to avoid spreading the beetle beyond the Regulated Area or onto your property. Be aware of where your delivery trucks are going. Plan your delivery route to make the restricted zone the last stop. The Japanese beetle is a notorious hichhiker. If you're making deliveries in the Regulated Zone, practice extra caution that a pest isn't climbing aboard. 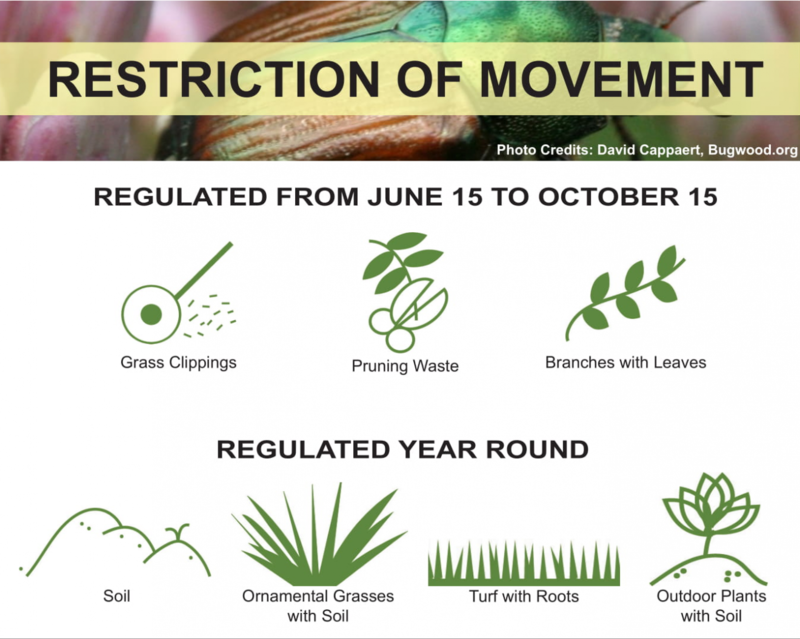 Plants with soil cannot be removed from the restricted zone without a Movement Certificate from CFIA, which requires a week’s notice to get. You may want to review your return policy. If you didn’t deliver, do you know where the plants have been? At least one retail nursery has already posted a No Return policy on their Facebook page for deliveries in and around the restricted area. Invasive Species Council of BC's webinar, Japanese Beetle - What You Need to Know (54 minutes), is available for download. The webinar was presented by Shannon Derksen and Melissa Cook, Canadian Food Inspection Agency, joined for questions and answers by Tracy Hueppelsheuser, Entomologist, Plant and Animal Health Branch, British Columbia Ministry of Agriculture on July 25, 2018. 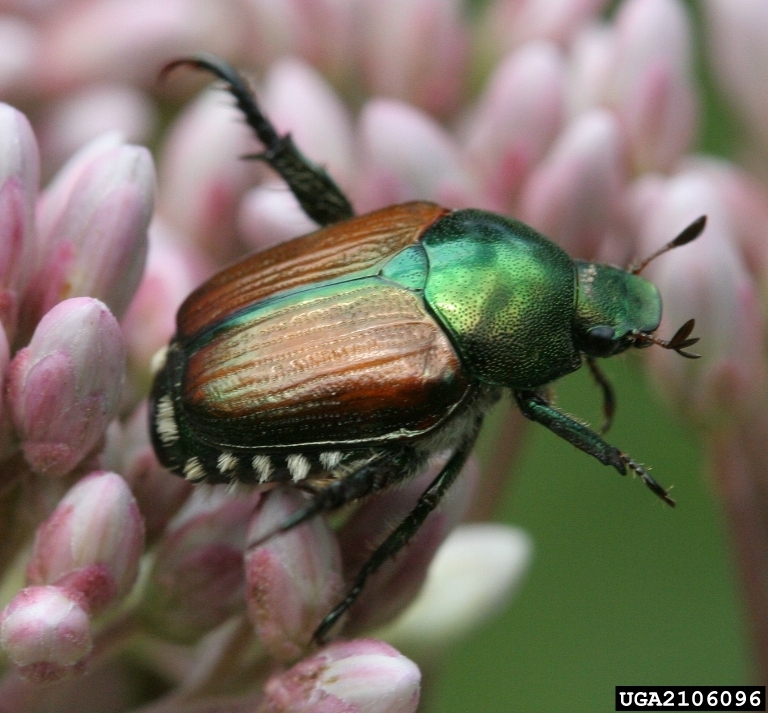 The webinar provides up-to-date information on the Japanese beetle eradication efforts and answers questions posed by concerned industry members. You must provide a close-up and clear photo of the pest. Note the time and the precise location. Note how many were found. Roses are most susceptible so check there first! Send it to [email protected] along with your contact information. CFIA will call you to verify your submission only if you have sent a photo. Watch the video from BCLNA’s Technical briefing session for landscapers held May 24, 2018 (1hr:45min) | includes explanation of 'Regulatory' Designation from CFIA and Treatment Application from the BC Ministry of Agriculture. If you have any sites in the treatment area, email [email protected] immediately for information. Click here for the Japanese beetle Fact Sheet. This project was funded in part by Agriculture and Agri-Food Canada and the Government of British Columbia through programs delivered by the Investment Agriculture Foundation of B.C.